A6 sized (10cm x 15cm) personalised invitations with free envelopes. professionally digitally Printed one sided, postcard style onto high quality premium satin 350gsm card stock and dispatched 1st class in protective packaging. You can specify all of the text so any invitation can be adapted for any occasion. You can also change the font and colours if you wish. Please contact us within 12 hours of ordering to tell us your personalisation details or your item may be sent blank/unpersonalised. Please tick the gift option during checkout to leave us a gift message with your personalisation details, or contact seller to send us an amazon message. Alternatively you can email the details to support@thecardzoo.com – please remember to include your name and order number in your email. Remember to include all of the details relevant to your invitations such as Names, Dates, Time, Venue & RSVP details. Your order will be delayed if we have to contact you for more info. Please be careful to check your spelling carefully as we copy it as you request. We will space the wording accordingly so the layout looks great before we print. Please use the size options above to select the quantity of invitations you require. The price will change automatically depending on the quantity you select. 1st class delivery is free within the UK. 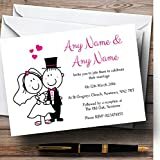 We have 1000’s of different personalised invite, save the date, thank you cards and rsvp cards in our store along with a great range of other personalised goods such as bunting, signs and posters, greetings cards, certificates, charts and business stationery. Professionally printed personalised invitations & envelopes. Printed one side, postcard style onto very high quality satin 350gsm card. You can specify all of the text so any invitation / card can be adapted for any occasion. To personalise, tick the box that says this is a gift, this will allow you to leave us a gift message – a box will appear with some text saying ‘enjoy your gift…etc.’ Please delete this pre populated text and instead enter your own personalisation instructions into box. Please then click ‘save gift options’. If you miss the box, you can use the ‘contact seller’ button from your orders page or any of our product pages to send us a message with your instructions. Alternatively you can email your details to support@thecardzoo.com – please remember to include your name & order number. Please check your spelling carefully as we copy it as you request it. Please only use capital letters where appropriate. We will space all text correctly prior to print.